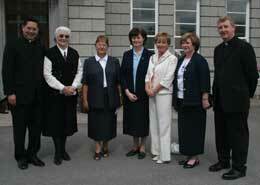 The Congregation of Sisters of Our Lady of Apostles (OLA) was founded by Fr Augustin Planque SMA. Fr Planque was the successor of the SMA founder, Bishop de Marion-Brésillac. As Co-Founder of SMA he made a major contribution to the Society which he led for almost 50 years, 1859-1907. “If there aren’t Sisters to train the girls there will be no Christian families” he said. Realising the great need there was for sisters to work alongside the SMA missionaries and to bring their own particular charism to the work of mission in 1876 he founded the OLA. Augustin Planque SMA died on 21 August 1907. OLA Sisters commemorated the centenary of his death in 2007 – 2008. Ardfoyle Convent was decorated beautifully for the opening of this special year of prayer and celebration (20 August 2007). Flags of the various countries where Irish OLA Sisters work were displayed. Bishop John Buckley (Cork & Ross) was the main celebrant at the Mass. The Irish SMA Provincial, Fr Fachtna O’Driscoll, preached the homily. Among those present for the Celebration was the Irish-bornOLA Superior General, Sr Eileen Cummins. The Apostolic Nuncio to Ireland and the Lord Mayor of Cork were represented in the gathering of more than 250 OLA well-wishers.